Brown Sugar Apple Grunt Productions - 86 min. 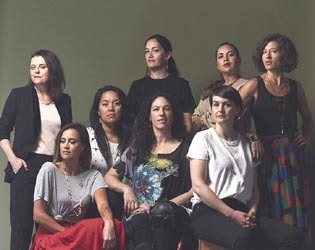 Principal Cast: Miriama McDowell, Tanea Heke, Kararaina Rangihau, Roimata Fox, Ngapaki Moetara, Acacia Hapi, Maria Walker, Awhina-Rose Ashby, Amber Curreen.. Writers: Briar Grace-Smith, Casey Kaa, Ainsley Gardiner, Katie Wolfe, Renae Maihi, Chelsea Cohen, Paula Jones, Hosephine Stewart-Te Whiu; Director of Photography: Drew Sturge; Original Music: Lauren King; Editor: Craig Parkes; Costume Designer: Lindah Lepou; Production Designer: Riria Lee; Producers: Kerry Warkia, Kiel McNaughton; Directors: Briar Grace-Smith, Casey Kaa, Ainsley Gardiner, Katie Wolfe, Renae Maihi, Chelsea Cohen, Paula Jones, Awanui Simich-Pene. Eight female Maori directors have each contributed a ten minute vignette, presented as a continuous shot in real time, that unfolds around the tangi (funeral) of a small boy (Waru) who died at the hands of his caregiver. 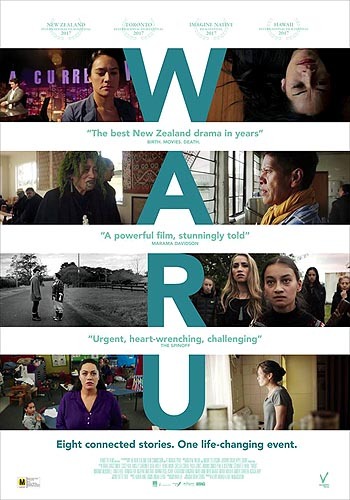 The vignettes are all subtly interlinked and each follow one of eight female Maori lead characters during the same moment in time as they come to terms with Waru's death and try to find a way forward in their community. In Maori, waru means eight. Although there are English subtitles for most times that Maori is spoken, this disc could have been significantly improved by have optional English subtitles for the whole film. Starting 31 January 2018, a PAL R0 DVD, is available from Australian and New Zealand resellers, selling for about $25nz or $20au, plus shipping. It is presented 2.39:1, 16x9 enhanced, with a dolby digital 5.1 spoken English/Maori soundtrack, with English subtitles when Maori is spoken. Extras include: 'What is Waru? '(1:28), Interview with Directors(7:03), Trailer(1:56) and stills gallery. Short Katie Wolfe video interview at youtube.